UKGS Solutions Ltd are authorised installers of the industry leading Krinner ground screw. Based in the Midlands we are ideally located to offer a professional and cost effective installation service nationwide. From garden buildings to sports equipment and from flag poles to lighting columns we can offer a foundation solution for every installation. Please get in touch and see if we can make life easier for you! A small domestic project where the client was installing was installing a conservatory. A row of ground screws were installed to form the conservatory floor foundations. Ground Screws used as a foundation between tree roots to which a steel railing can be bolted to create a boundary line. Park Home & Lodges are traditionally sited on concrete foundations. 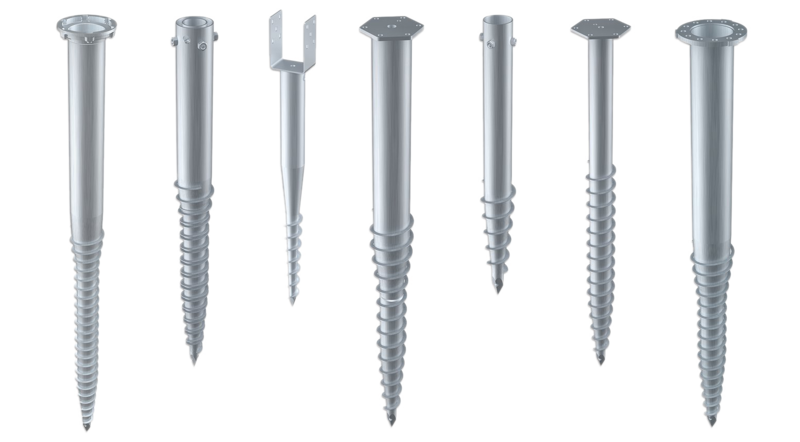 Ground Screw foundations offer a quicker, less invasive and more cost effective alternative. We have a range of over 50 ground screws, combining different lengths and diameters with several ‘head’ configurations, to suit hundreds of different product applications. To find out more details of our Ground Screw installation service, pricing or applications please get in touch with the contact form to the right or just give us a call.